If you have read my articles during this past election, you will note that I have referenced artists and their respective songs. In this instance, I have referenced singer Johnny Nash’s 1972 song, “I Can See Clearly Now The Rain Is Gone.” In the title of this article I have changed one word for the purpose of emphasis, from “Rain” to “Reign,” as it relates to the subject matter I have written. In the history of mankind, we have often heard the word “reign” as it pertains to ruling leaders of world countries. Men have reigned for centuries over empires, kingdoms. etc. For the purpose of this article, I am going to refer to two individuals who reigned over an “Empire” and the other over a “Kingdom.” One was a “Secular” Emperor and the other was a “Divine” King. Both lived during the same historical time period. The Emperor was Julius Caesar, the King was Jesus Christ. It is easy to confirm Caesar’s role, however, confirming that Jesus Christ was the Head of a Kingdom would be more of a challenge. It is based on faith, His teachings and His actions. By now, most readers would be saying, “but what has this to do with the election?” IT’S A CASE OF DIVINE INTERVENTION. Has faith played a role in this election? I decided to conclude the 2016 election by looking at the role faith has played in Donald Trump being elected. Faith in God touches all aspects of one’s life. Ergo, should you run for public office, the depth of your faith will have a direct impact on your political convictions and the public good. You will also be influenced by those who surround you who hold their own beliefs. Looking at this past election, one cannot help but see how “faith” played a major role within both the Republican Party and Democratic Party. It is my intent to take a closer look at Republicans, in terms of “faith,” since Donald Trump ran under the Republican banner. The Republican Platform affirms that God is central to American government, society and our way of life, saying: “every time we sing, ‘God Bless America,’ we are asking for help. We ask for divine help that our country can fulfill its promise.” The Platform affirms what the Declaration of Independence sets forth: “That God bestows certain inalienable rights on every individual, thus producing human equality; that government exists first and foremost to protect those inalienable rights; that man-made law must be consistent with God-given, natural rights; and that if God-given, natural, inalienable rights come in conflict with government, court, or human-granted rights, God-given, natural, inalienable rights always prevail.” Republicans “support the public display of the Ten Commandments as a reflection of our history and our country’s Judeo-Christian heritage. Donald Trump was born into a Presbyterian family. His parents attended Marble Collegiate Church in lower Manhattan along with their children. Donald, himself, retained a connection to that church in his adult life. Though not currently an active member, he has stated publicly that he considers Marble Collegiate to be his church. Presbyterianism and good works ethics go hand-in-hand. 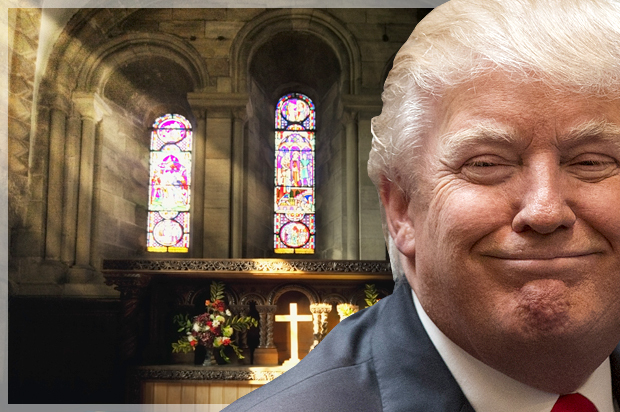 It is obvious that Donald Trump has been influenced by his religious faith. Having an understanding of faith and its daily influence, one cannot help think that the choice of Mike Pence as the vice-presidential candidate is reflective of Donald Trump’s beliefs and faith. Given the number of ‘faith-based” people forming part of Donald Trump’s team, the number of “prayer groups” throughout the USA having devoted their time on his behalf and the fact that very few people thought he would be the next President, one can only conclude that “Divine Intervention” must have played a role in him being elected. Jesus Christ found Himself in a similar situation when He entered the temple and drove out all who sold and bought in the temple, and he overturned the tables of the money-changers and the seats of those who sold pigeons. He, too, wanted to cleanse the temple of corruption and remove those who believed they were the establishment and the elite. But more importantly, the American people wanted someone to stand for the “TRUTH.” For what ever reason, they saw this opportunity with Donald Trump. As the campaign moved along, those opposed to Donald Trump would confirm daily that you could not find someone further than the “truth.” The Donald would either exaggerate, stretch the truth or outright lie. Was he any different than those running Washington? Curiously enough, millions of Americans believed he was. It seemed irrelevant to many, since they finally had a “voice” opposing Washington and would make their “views” known to the establishment. Democrats hate God… they think God is a joke. They like Sodom and Gomorrah.